I've been discussing labor force participation lately. My first look at the recent trends in labor force participation was only for ages 25 to 54. I excluded people age 18 to 24 with the belief that people in that age range are going to college more which skews their labor force participation rates. First lets look at men age 18 to 24. Those lines seem to slope in the opposite directions at about the same rate. In fact from 1980 to 2009 the percent of population in college was up 14% and the labor force rate was down 12%. Now the women age 18 to 24. 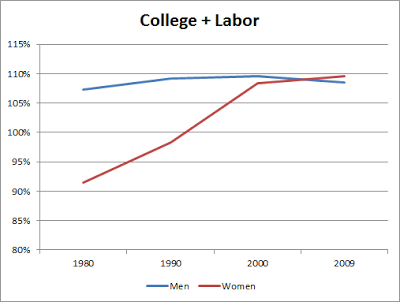 Women went to college at a faster rate. They went from 24% to 45% an in crease of 21% of the population. At the same time their labor force rate waffled and dropped and is down 3% net. 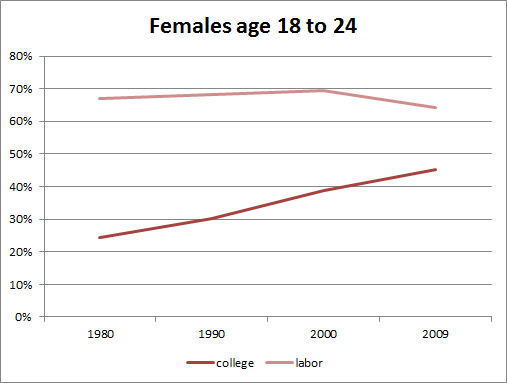 The trend here is a little different than for men as the college enrollment rate is up a lot but the labor force is less changed. You might have noticed in the two charts above that if you add the college attendance rate and the labor force participation rates that you get more than 100%. We can assume that is due to overlap with a certain group that both attends college and works. As you can see there, the total percent of the population working and/or in college has just recently about hit parity between the sexes. For men I would conclude that the increased college attendance and decreased labor force are equal and opposite. 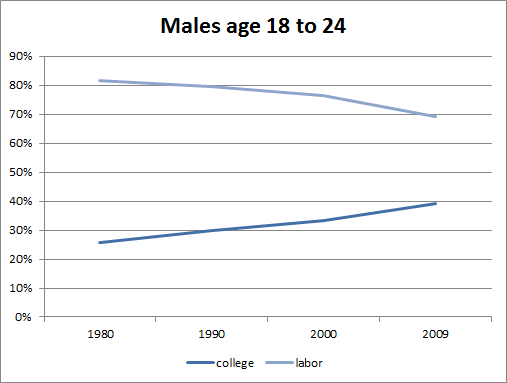 More men are going to college than joining the workforce. On the other hand for women I'd say that rather than joining the workforce at a higher rate as is the general trend for women, more young women are instead going to college at even higher rates than their male peers.